Hello! Thank you for the kind words you left on my last post, as well as email messages. I appreciate all of your good thoughts and concern. I'm feeling much better now. We had a hard few weeks with a lot of things to discuss and decide, but we have a good plan and the Bear will stay healthy. The return to normalcy after the holidays has been really welcome. I never do well with long stretches of idle time. I can always find things to do, of course, but I like having a routine and a plan for my days. I like knowing where I need to be. A few days without a plan are fine, but a few weeks starts to grate on me. I've been cleaning in the mornings while the small Bears are at school, straightening up the kitchen and living areas, washing all the bedding and scatter rugs, wiping down mirrors and windows and just generally getting things tidy again. Christmas makes it hard to clean the house, I find, with all the new things taking up space and collecting dust. I love having the tree up, but the living room is so much brighter without it. I guess what I'm saying is that I'm kind of glad to have it all behind me. This is one of my favorite times of year, and one where I feel like I'm at my best - motivated, enthusiastic and positive. Most of the time, anyway. I never make New Year's resolutions because it's too hard to keep them. I always feel pressured and give up. But, I do try to do some things better. This year, I'm going to try to keep up better with my magazines. I've always got a book going, but I often put off reading a new magazine until it doesn't really feel relevant anymore. Do you know what I mean? Why read a summertime issue of a home-and-gardening-focused magazine in the dead of winter? I could learn things for the next growing season, yes, but it feels weird and wrong. I like my magazine-reading to be in the moment, whenever possible. To that end, I started the year by sitting down at the kitchen table with my tea and spending an hour with Martha. Now I have a couple of new soup recipes on the docket and a new shower-door cleaning technique to try. Good for me. Did you notice my kitschy, fruity tablecloth up there? It was a Christmas present, along with another that has a toile design in blue on white. They're both oilcloth, purchased from Freckled Sage on Etsy. I know tablecloths might seem like strange Christmas presents, but I really wanted them. I'd been eyeing them for a long time, and when the shop had a really good sale on Black Friday, I ordered two for myself. I love oilcloth; it's so easy to care for and the patterns are bright and fun. I usually keep a vinyl cloth on the kitchen table because I can't keep up with the grossness, but nothing looks as good as real oilcloth, in my opinion. Everybody better treat them right! I bought a new candle and have been enjoying it in the dark evenings. It's just a cheap one from Walmart, but I love the pretty coral-pink color and the scent, Sweet Pea. It doesn't smell as good as real ones, but pretty close. It was nice to put the pine-scented candles away for next year and start something fresh and light. Evenings are indeed early and dark, but the weather has continued to be warm and dry. We haven't had measurable precipitation since the end of September. I know that sounds crazy to those dealing with blizzards and extreme cold this winter. But here, it's calm and clear almost all the time. There are a couple of potential storms in the forecast for this weekend and next week, though, so our luck may be changing. I would love to have some rain or snow. In the meantime, I'm drying things outdoors on many days, like these tights belonging to Miss GB. My pothos/philodendron is growing! Slow but sure. There are pieces on two sides of the pot that are beginning to put on leaves that I think will eventually begin to trail. I've been watering on Sunday afternoons and it's starting to feel like a habit now. Check out my amaryllis! It's so neat. The bulb is dipped in thick red wax and it never needs potting or watering, you just leave it to grow on its own. I've never seen anything like it, but I'm really excited because it has two stalks, which means two sets of flowers and they will be bright red - nice and cheerful for wintertime. 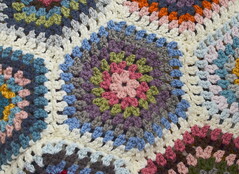 I'm very nearly finished crocheting my stash-buster blanket. I have just two more squares to make for the lower right corner, and the blanket will be ready for a border. I've really enjoyed making this blanket, especially during times of stress lately. A simple, fast-growing crochet project always feels good. The LB, at 12, is now taking an interest in his hair - both style and daily management. I never thought I'd see the day. He was always good about showering every night, but now he's become very agreeable to a morning hair routine too! It's actually funny. We looked through photos online from men's hair-styling websites and blogs, and we chose something to show the hairstylist. Then she showed him how to comb it and give it a simple style with a little gel. I've helped him a bit at home and now he's looking sharp every day. I have some sewing to do soon, which I'm looking forward to. I need to make a set - quilt, pillow and mattress - for another doll bed, similar to what I made for the GB's doll, Nora, a couple of years ago. I've already made another tiny 12-square Flowers in the Snow blanket. All of this is for another doll, the American Girl Truly Me doll that we gave the GB for this past Christmas (it looks just like her, with "caramel" hair and green eyes, so much fun to have a doll with your own features!). Madeline (the name she chose) is Miss GB's first really nice doll. The Bear has already built a lovely wooden bed, which she sleeps in every night. He was finished in time for Christmas but I was not. I only had the crocheted blanket ready, but the GB is a very understanding young lady and she's giving her tired, old mom a chance to come through with the rest sometime in the near future. My other Christmas presents include DVD's of the first two seasons of The Golden Girls, a show which makes me indescribably happy. "Shady Pines, Maaaa!" Just getting caught up on blog reading, sorry to hear about your husband's health problems, hope it settles into a manageable state. Really like your Amaryllis, I'm sure I've never seen one quite like that. We had the first snow we've had since we moved here, pretty to look at, but a mess to deal with. Love the tights on the line. I ALWAYS had oilcloth or vinyl on the table when we had children at home. Now I get to use cloth, but I really like your happy oilcloth! There was so much enjoyable to read in your post today Jennifer. I smiled at the thought of the LB taking an interest in his hair. I think that's about the age my boys did the same. He's growing up! I didn't set resolutions but I did set some goals. One is to read more, a lot more, but the big one is to cultivate the Fruits of the Spirit in my life. I hope you have a lovely weekend with your family. I am just like you with magazines, then I end up rushing through them just to get them read. I love your stash blanket! Jennifer, I am not all caught up with your news, but just now read about the Bear's illness and am thankful there is successful treatment for him. I can imagine the stress you have had sorting that out during the holiday season, because I have been in CA again since Dec. 3 with my oldest sister who had surgery just before I arrived. She is healing well from that but had some painful side effects from other treatment afterward. I plan to be down here through January. At any rate, I hope to get caught up on blogging soon. I am fascinated by your wax covered bulb and can imagine it will have beautiful blooms :) Wishing you and yours well! Such lovely Friday happies. I loved the oil cloth table cover, a real delight. The tights on the line made me smile, I always like to hang the washing out to dry if I can. You can't beat the wonderful smell of washing dried outside. I must admit to been glad this year to have all the decor packed away, nice to have some normality and clean surfaces. Take care. those are some lovely things. I hope things continue to go well for you and family! A hug! Sounds like Christmas was wonderful at your house. Both table clothes are lovely. 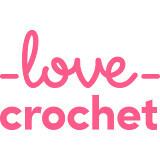 I wonder what method you use to join the squares of the crochet blanket. I have never made one with several squares yet. You're a great inspiration! Happy and healthy 2018 for you and family. We definitely need to focus on the happy. 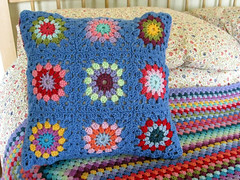 Granny squares always bring me joy ... the making of them and seeing them showcased by others. Very interesting about the wax dipped bulb. Haven't seen that before. Love this post! And I adore your new tablecloths - they are so colorful and just happy! Going to check out that Etsy site as I could use a new tablecloth. My daughter received an American Girl Bitty Baby for Christmas and she loves her. It's so sweet to watch her mother her. She gives her a bottle, changes her diaper, and keeps her nice and warm wrapped in a cozy blanket. Its all very sweet. She received a Truly Me doll who she named Gracie for her eighth birthday last year, so she is big sister to the new Bitty Baby. I recently updated my blog after almost Two years - pop over and say hello, if you get a chance. Oooh, your new tablecloth is beautiful! I love oilcloth too. It sounds like you're having a wonderful start to the new year. I need to learn about American Girl dolls -- I've been told they've changed a lot since our children were little -- in that you can't get the same dolls anymore. I'm thinking I'll be wanting to get one or two for my little granddaughter in the future! Hi Jen.. I hadn't been up to date with your blog.. sorry to hear bear has been having health issues.. I can't imagine how stressful it must have been for you and the family to deal with it all. Oil cloth table covers are great.. though I hardly ever cover my table with them. We often sit on the floor to have our meals.. and they are great to protect the carpet from spills. I love a Friday happy! Those 52 weeks of happy posts of old made me stop and appreciated the little things that bought a smile to my face. Perhaps we should resurrect it once more. I do like your oilcloth. I bought one on sale last week. It's a polka dot, and saves my table from a lot of wear and tear. My house plants seems to be doing well. I'm putting it down to healthy neglect!